Continuing east on Highway 60, we went through Charleston. The city and surrounds are larger than I expected, and generally very nice. Another 15 or so miles down the road we passed Falling Rock, and shortly after that headed north on Highway 119. Hwy 119 is a 2 lane highway that winds up and down (and up and down and up and down and up and down) through many little towns and some extremely scenic areas. Most of the highway is down in the bottom of valleys or ravines, running parallel to creeks or rivers. In some places, the houses are right up against the road and the creek/river runs right behind them. Other places there are bridges to get across to the houses. Most of the homes we passed were well maintained and attractive — it’s apparent that there is some considerable pride in home ownership. I also saw a lot of small home improvements going on – decks being built, driveways graveled, re-roofing, etc. Another sign, I think, that things are improving in rural communities. We followed Hwy 119 north to Spencer, and then east/northeast to Weston. As mentioned, it was very up and down. Like 3 -5 miles winding UP, and then 3 – 5 miles winding DOWN. Rinse and repeat. Being that we are in a big, older bus, towing a car, we don’t zip up the hills and are slow and careful coming down the hills (especially when it’s a 6 – 9% grade for five miles). The result? It took us about 4 hours to go about 130 miles … that’s an average of just under 33 mph. Slow going for some, but for us it was sort of “business as usual”. You never know what you’ll get when you take the backroads! 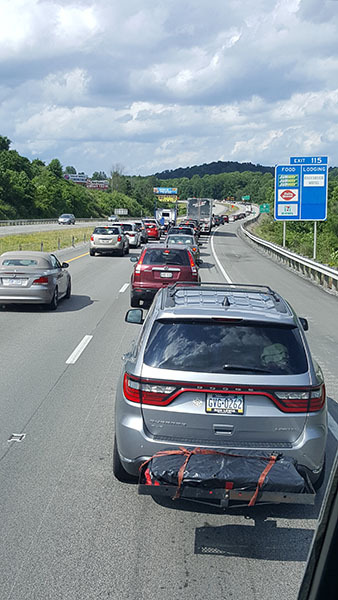 At Weston, we decided to jump on the I-79 and go north for about 20 miles, so we could continue east on Hwy 50, the “Northwestern Turnpike.” Just figures that the one stretch of road where we could go 65 mph, there was construction! Several miles of bumper to bumper, one-lane, freeway traffic. After about 30 minutes of slow going, we finally got to Bridgeport and onto Hwy 50. I had expected a “turnpike,” as in a wide road, maybe two lanes each direction, wide curves, designed for faster travel. Unfortunately, that wasn’t the reality. It was just another winding, two lane, up and down highway. Emphasis on winding and up and down. The road took us pretty much due east, and through the bottom of the westernmost part of Maryland. We were in the state for such a short time that I didn’t even bother to take pictures of the state border. Luckily we’re not in a big rush, and we still made it to the WalMart in Keyser before dark. The woods in eastern West Virginia are beautiful. I especially love the wild rhododendrons, which are in bloom at the moment. Rhodies, particularly wild rhodies, have always been one of my favorites. 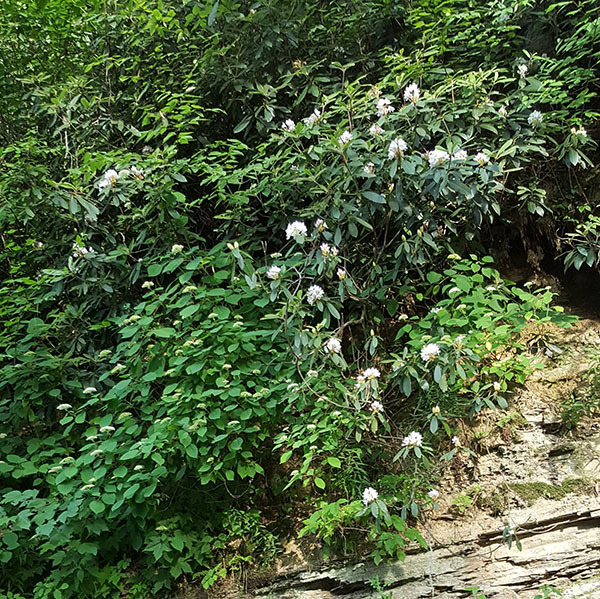 Wild Rhododendrons in bloom along the highway hillside. 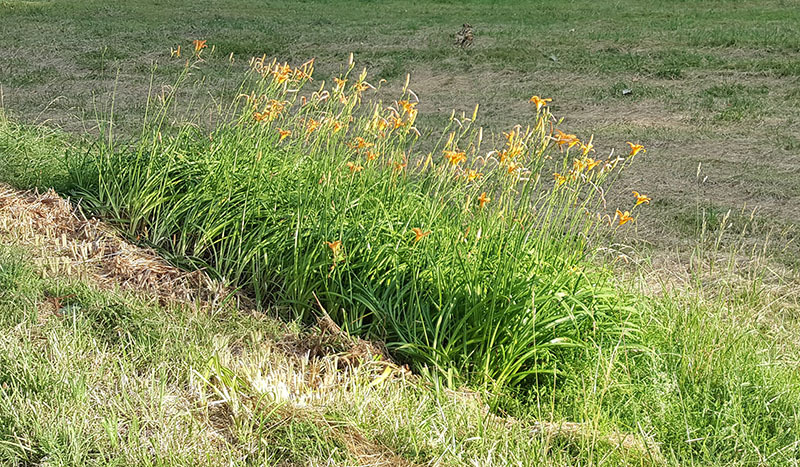 Orange lily patch along the roadside, Makes me miss having a garden. All in all, it was a long, long day. Driving 248 miles at (mostly) 30 – 40 mph takes a long time. Thank goodness we can just turn out the lights and crawl into our own bed without doing anything much other than setting the brake and locking the door!